"Smokers are twice as likely to quit when they get text messages urging them to stick to their goal of being smoke free compared with those who receive texts with no motivational messages"
messages to smokers doubled quit rates at six months. The findings of the txt2stop trial, which was led by the London School of Hygiene & Tropical Medicine and funded by the Medical Research Council, are published in The Lancet today. With being a rapid raise in the smoking rate and mostly average of them intend to quit it, the latest study report a relief. "txt2stop" trial, the first such study to verify quit rates using biochemical testing, may offer a cheap and easy way to improve levels of health by increasing the number of people who give up smoking, says experts. The researchers briefed their findings could be translated into a potentially powerful public health measure, while the rates of smoking rising in many developing countries and tobacco predicted to kill 8 million people a year by 2030. "To scale up the txt2stop intervention for delivery at a national or international level would be technically easy,"
She added the scheme may need some adaptation, translation into other languages, and local evaluation before it is used in other populations, but added that it is simple, cheap and "likely to be highly cost-effective." "one of the biggest public health threats the world has ever faced." The texting trial randomly allocated 5,800 smokers in Britain who wanted to quit to either the txt2stop program or to a control group who got on-motivational texts. The motivational texts included encouragement up to the actual quit day, advice on keeping weight off while quitting, and help dealing with cravings. The craving text, for example, said: "Cravings last less than 5 minutes on average. To help distract yourself, try sipping a drink slowly until the craving is over." Non-motivational texts just thanked people for their participation, requested confirmation of contact details, or said a range of other things not connected to smoking. The researchers used saliva tests to verify whether those who said they had stopped smoking had actually done so. The results showed that those in the txt2stop group were more than twice as likely to report biochemically-verified quitting than those in the control group, with success rates of 10.7 percent and 4.9 percent respectively. "People described txt2stop as like having a 'friend' encouraging them or an 'angel on their shoulder'. It helped people resist the temptation to smoke." 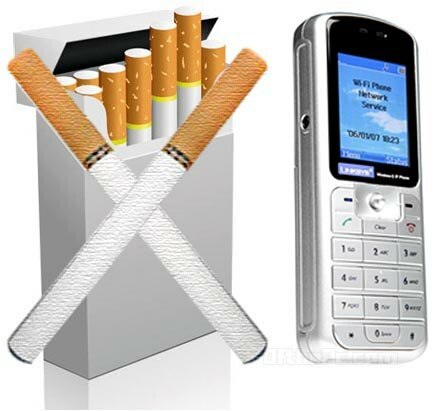 "Text messages are a very convenient way for smokers to receive support to quit,"
Because of the rapid growth in both mobile phone use and smoking in some poor countries, the lessons learned from the txt2stop trial could provide a new approach to smoking cessation campaigns in both wealthy and low-income countries. Derrick Bennett and Jonathan Emberson from Britain's Oxford University said In a commentary on the findings.